I started off my day with a strawberry kiwi smoothie bowl! The base is strawberry-orange, topped with chia seeds, blueberries, raspberries, and kiwi. For lunch I made some scrambled tofu and a Gardein Crispy Chick'n Pocket Meal. Scrambled tofu is super easy to make, my husband and I make it all the time! I also recently found Gardein's Crispy Chick'n Pocket Meals, which are made with kale and barley. These pocket meals are quite good - I've never been disappointed by Gardein before. Throughout the afternoon I snacked on an orange and an apple. For supper I made a veggie stir fry with carrots, onions, baby corn, water chestnuts, and tofu. I mixed everything up in garlic hoisin sauce, and served on a bed of jasmine rice. 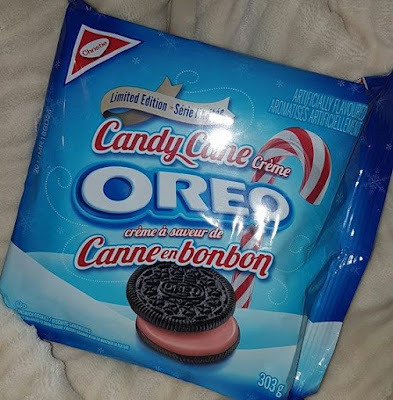 I found Candy Cane Oreos in the grocery store and just had to have them. Trust me, you need to try these out, especially if you like mint & chocolate.